On the off chance that you've been perusing this blog for some time, you may have seen that I completely love cooking meats in little pieces. There's something stunning about the manner in which each chomp ends up with such a great amount of flavor notwithstanding the most infinitesimal of cooking times. 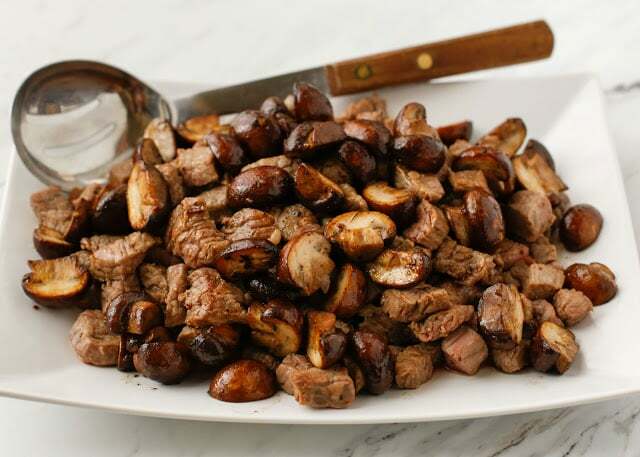 From the absolute first nibble, these Buttered Steak Bites with Mushrooms turned into a moment most loved for my entire family. This is the most delicate steak you can envision and my entire family goes crazy for it. Chomp estimate bits of delicate steak are burned in a hot skillet only for two or three minutes until each nibble is freshly cooked outside and delicious inside. As the meat is cooking, if a piece is somewhat bigger and has a side that appears as though it hasn't seared, flip to that side again for 20-30 seconds. Take alert not to overcook the steak. Cut the steak into bite size pieces, about 1/2" - 3/4" in size. Sprinkle the meat generously with 3/4 teaspoon salt and pepper. Heat a heavy flat bottomed stainless skillet over medium high heat and add 1 tablespoon of butter. When the butter has melted, swirl to coat the pan. Add about a third of the meat and spread it across the pan. Cook for 1 minute and then use a large spatula to flip the pieces over. Cook 1 more minute. Use a spatula to remove the meat to a plate and then repeat with a second batch of meat pieces. Add an additional tablespoon butter to the skillet. The entire cooking process for the meat should only take a few minutes total. When the meat has finished cooking, loosely tent foil over the cooked steak bites on the plate. Add the remaining 2 tablespoons of butter to the hot skillet and toss the mushrooms in the butter. Sprinkle with the remaining salt and let the mushrooms cook without stirring for 2-3 minutes, until browned. Stir and let cook a few more minutes until soft. Add the mushrooms and the buttery pan drippings to the plate with the steak bites. Serve hot. Enjoy!